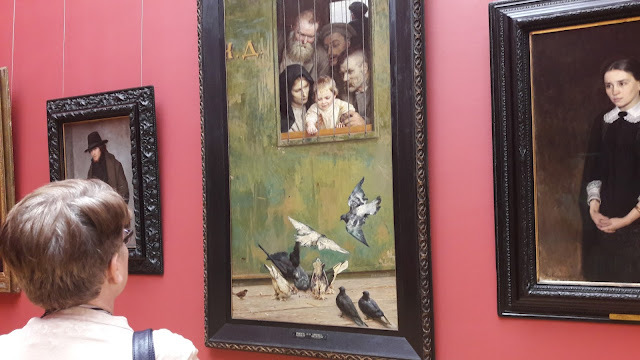 One of our old friends at the Tretyakov gallery: Nikolai Yaroshenko's "There's Life Everywhere." Hello from an apartment on Bolshaya Dmitrovka in Moscow. We're having a wonderful time serving as hosts and tour guides to a group of our friends from Northwest Yearly Meeting. Today was the start of our Moscow adventures as we visited the Cosmas and Damian Church just off Tverskaya Street, then Red Square, the State Tretyakov Gallery, and the Friends House Moscow office. We had plenty to discuss this evening before starting to rest up for tomorrow's new adventures. During our discussion in the FHM office, the subject of silence came up, which reminded me of this post, which I decided to rerun here. Just one correction: The "Thursday group" now meets on Wednesdays. 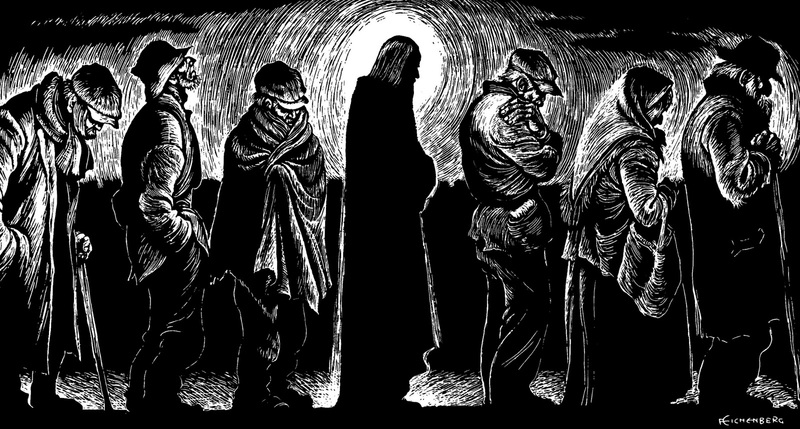 Fritz Eichenberg, Christ of the Breadlines. The "Thursday group," a circle of Friends who meet on two Thursdays a month, invited me to speak on Friends' understanding of silence, which I did this evening. I was so delighted by the invitation, since for me silence is like spiritual oxygen. I started by telling about an incident that happened to me at the age of 19, when I was living in rural Pennsylvania and had to walk an hour every workday in the early morning, sometimes starting in darkness, to meet my ride the rest of the way to the Western Electric factory at King of Prussia. I spent the day on the assembly line. At the end of the day, I had the same four-mile walk in reverse, back home. One day, walking in silence as always, I was suddenly overwhelmed by the certainty that I was not an observer, separate from the landscape around me, but that I was the observed one, with the whole visible reality around me was doing the observing. I fast-forwarded a few years to Ottawa Friends Meeting, within whose community I lived for three years, 1974-77, from the time I became a Christian until the moment I left Canada. I talked about my spiritual mentor, Deborah Haight, and the sense of centeredness I felt in her presence. Deborah was born into a Conservative Friends family in Norwich, Ontario. There were some in our Friends meeting who seemed to aim for an ideal of perfect silence in the meetingroom--street noises and even the sound of children could be a problem. But I had this feeling that Deborah held silence within her. And if, even so, I speak, it's just to communicate with those whose silence resonates with mine and who hear the Silence of God in my words. And if I speak again after that, it's to encourage silence among those ready to receive it. And a bit further on, It's important to practice silence regularly. The Spirit blows where the Spirit wishes, but fills only those sails which are already raised. Here I emphasized the inner discipline implicit in Lacout's words, and asked if this was any different from what Katherine Evans was talking about among early Friends when she said, "...we had thousands at our meetings, but none (of us) dare speak a word, but as they are eternally moved of the Lord...."
And when Northwest Yearly Meeting Friend Jan Wood encourages us to "tell the stories of God's power among us," as we might experience it in worship, is this the same kind of talking that Pierre Lacout advocates among those who would otherwise prefer silence? As we discussed how to bring the gift of silence to those for whom deliberate silence is a wholly new idea, Friends mentioned how important it is to demystify it for newcomers to our worship, and not to let Quaker "culture" repel the tender visitor. contemplative silence is visioning that doesn't require an objective, a target. It can only be designated as a direction. It involves looking in the direction of something, rather than looking right at something. Conceptions of God are fine as long as I quickly move beyond them. As a starting point [for the practice of silence] we choose an object that can gather together our spiritual strengths, rather than letting them dissipate. This kind of preparation can be endlessly varied according to individual inclinations, character, vocation, and religious experience. 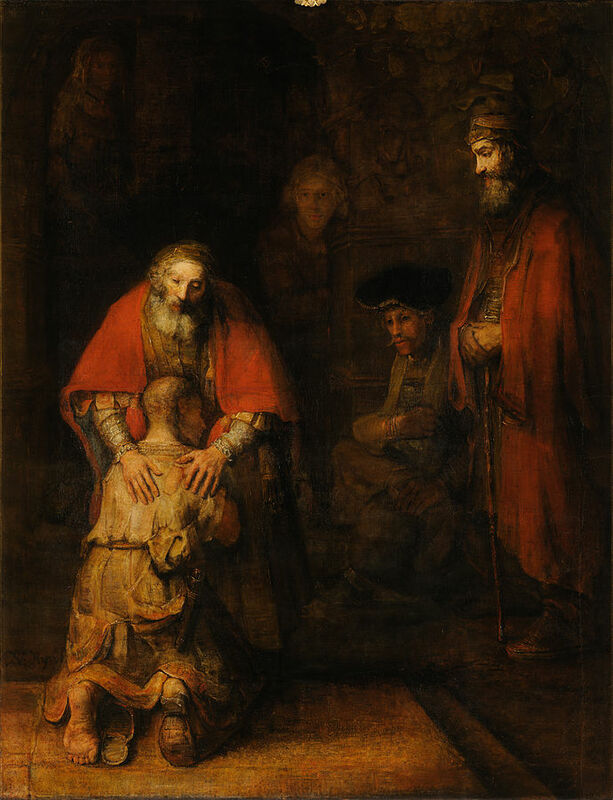 Here I mentioned the role of pictures (Eichenberg, for example, or Rembrandt's Return of the Prodigal Son) in my own life, as well as music, books, and so on. I wish we had spent longer on gathering ideas from the other participants this evening. I mentioned that lot of spiritual literature, including that written by and about Friends, reminds me of socialist realism--it's so upbeat and aspirational that we can wonder whether we'll ever have such wonderfully angelic and serene inner lives. Lacout writes honestly about two main obstacles to growth in silence--firstly, distractions and dissipation, and, secondly, the inner demons of the subconscious. The one who doesn't stop along the way, but goes on past the joys of reflection, and arrives at genuine silence--in other words, the one who seeks the deepest Center, the very heart of existence--cannot avoid encounters with the subconscious and its phantoms. Rembrandt, Return of the Prodigal Son; source. Unfortunately, we barely had time to touch on this important aspect, and the related topic of inner healing, during this evening's session. One of the topics of our lively discussion afterwards was this question: was there a difference between what we know as Christian prayer and the sort of objectless, contemplative silence that Lacout seems to describe? In the material I distributed, I mentioned Brent Bill's comparison of the Eucharist and Quaker worship, particularly his insight that "We become the liturgist, priest, penitent, and communicant." None of these roles are the end point of silence, but to me they are crucial movements on the path. I talked about the villages in my head (now there are four!) in trying to describe why, for me, intercession is one of the central "objects" of silent prayer. I may cherish the experience of absolute self-abandonment to the Holy Spirit, but first I have to stay rooted enough to keep my promises! It's also vitally important to remember that Pierre Lacout's definition of a mystic implies that the practitioner of contemplative silence may be "objectless" but is far from empty. I remembered the biblically resonant comments of my Dagestani conversation partner last week--"If God isn't there, something else will fill that space." I'm so grateful to the Thursday group for giving me the chance to put these thoughts together and to hear their experiences. Including our own time of silent worship, three hours flew by too quickly. There's a lot of online comment on Morgan Freeman's participation in the Committee to Investigate Russia and its "War" video. Two responses caught my attention: one calm and balanced, and one that is not so calm but still balanced.... Judge for yourself! 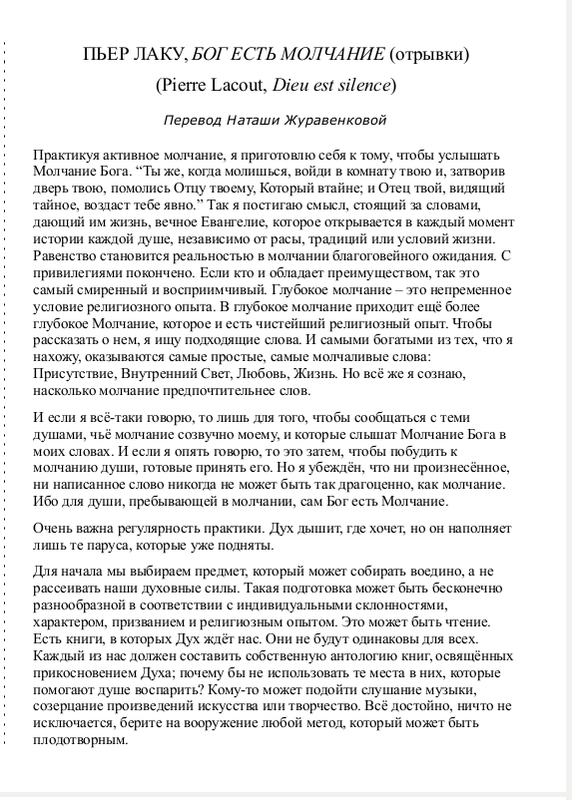 Do Russian studies have an alt-right problem?